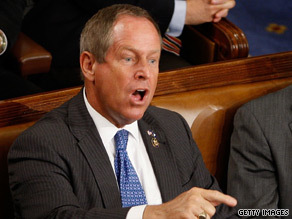 (CNN) -- In the days after Joe Wilson shouted "You lie!" at President Obama during his address to Congress last month the South Carolina congressman reached out to several of his longtime confidantes. Rep. Joe Wilson has become in demand on the GOP fundraising circuit since shouting at President Obama. A graduate of Washington and Lee University, a school with a strict honor code, and a veteran of the Army Reserves, Wilson was worried he had disappointed those close to him by showing a lack of civility. "Joe has always operated as a gentleman, and I think for anyone to question if he was continuing to do that is something that concerned him," his friend Ed McMullen said. But the people close to Wilson assured him that beyond apologizing for the outburst, he did not need to be ashamed for questioning the president's sincerity in the health care debate. Wilson made the outburst after Obama denied his health care plan would cover illegal immigrants, then apologized to the White House later that night. That sentiment is shared by grassroots conservatives around the country, and his two-word shout has transformed a previously little-known congressman into a full-blown political celebrity, albeit a polarizing one. South Carolina Democratic Party chairwoman Carol Fowler called him "a do-nothing." "He doesn't do anything particularly," Fowler said. "He does parades. He hands out keychains." But conservative activists have a very different opinion. At a high-profile anti-tax rally in Washington on September 12, conservative demonstrators wielded signs reading "Joe Wilson for President" and "Joe Wilson Tells The Truth." On his campaign Web site, supporters are encouraged to purchase T-shirts, coffee mugs and trucker hats emblazoned with the phrase "Joe Wilson: Republican for Congress." Wilson also joined the company of other famous politicos by becoming the subject of a "Saturday Night Live" parody last month. The normally low-key congressman has been diligent in declining interview requests from mainstream media outlets, instead opting to maximize outreach to conservative opinion makers and activists. The biggest benefit is financial. In the 12 days after the shout, Wilson collected more than $2 million from supporters. It's a stunning figure that exceeded the $1.2 million his campaign organization spent during 2007 and 2008, when he won a tough re-election battle over Democrat Rob Miller in the Republican-leaning 2nd Congressional District. His campaign quickly bulked up to seize the fundraising opportunity, retaining a Washington-based new media strategist to boost his profile on Twitter and on conservative blogs. Wilson also uploaded fundraising pleas to YouTube. When House Democrats organized a vote on the House floor to formally admonish him, Wilson's staff purchased high-profile ad space on the Drudge Report with the claim: "Joe Wilson is under attack. You can help." The next round of fundraising reports, due October 15, will almost certainly show Wilson with a larger campaign war chest than most of his fellow members of Congress. Other Republicans are hoping he spreads the wealth. Wilson accepted an invitation to speak at a Missouri Republican Assembly dinner in Springfield over the weekend, appearing alongside Senate hopeful Rep. Roy Blunt. He also lent his name to a fundraising solicitation e-mailed out by state House Republicans in Virginia. Wilson has received 10 formal speaking requests since the shout and "numerous" other invitations from around the country, his office said. While Wilson's outburst has endeared him to GOP activists, it also turned him into a top Democratic target. That reality was crystallized by a recent fundraising trip to Michigan in support of Republican congressional candidate Tim Walberg. Responding to Walberg, the Democratic incumbent, Rep. Mark Schauer, sent several e-mails to supporters calling attention to Wilson's visit and asking for contributions. Walberg's staff did not respond to inquiries about how much Wilson collected for the GOP candidate, although more than 100 people reportedly attended the Michigan event. But the Schauer campaign eagerly boasted that the Democrat raised more than $55,000 off the Wilson fundraiser. "It's clear that Michigan voters are rejecting Tim Walberg and Joe Wilson's brand of obstruction," said Schauer spokeswoman Sarah Blaney. Democrats in South Carolina are hoping Wilson's outburst will provide enough ammo to sink him in 2010, even though the midterm election is shaping up to be a favorable one for Republicans. Miller, a Marine Corps veteran who is once again challenging Wilson, has taken in nearly $2 million of his own and has the backing of the Democratic Congressional Campaign Committee. "The tremendous outpouring of support for my campaign in recent weeks is a sure sign that voters are tired of antics like Congressman Wilson's," Miller told CNN in a statement. "Over 40,000 people have reached into their wallets to say that they want a representative who will reach across party lines to tackle the challenges facing us."